Background, Robert Garner and Frank King packaged and helped extract and load the CT 1401 here. Most of the eventual crew of Ron Williams, Bob Erickson, Frank King, Bill Flora, Stan Paddock, Ed Thelen and Robert Garner were present when the BIG truck began to unload. Trying to maneuver that big truck into the loading bay OOPS - into the tree - Frank ran waving, but apparently Jeff was watching the other side Plan B, got the truck turned around, trying from the other side. Now to connect the truck with the loading dock - Jeff the driver is in the blue shirt - The riggers/movers (down and at the switch) are taking over. CPU, with cables on top. Frank, squatting, checking the packing and wheel, Jeff the driver on right. Off the truck, into "InVisible" Storage A-Rollin along - a box of spare cables, and a box of spare SMS cards Don't we have a lovely environment? 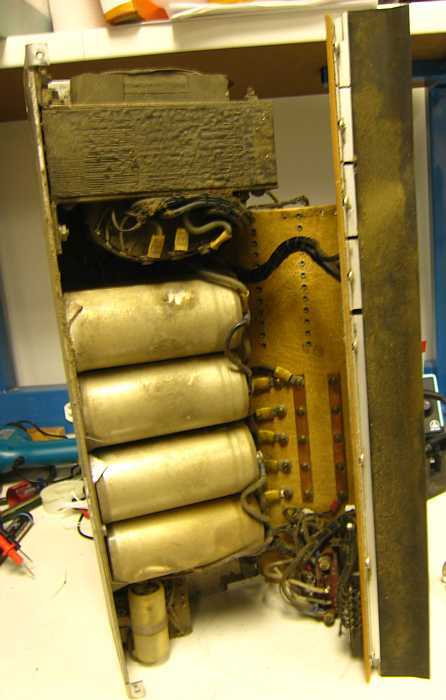 The 26 3500 ufd 70 working volt capacitors in the other 1402 were wired together. 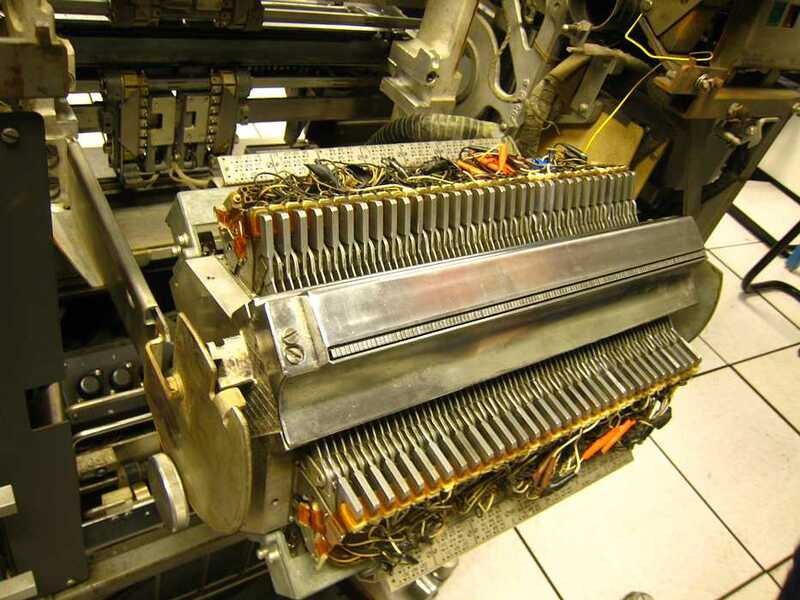 Here, each capacitor was connected in parallel by connective plates Both plates removed, exposing isolated capacitators, ideal for testing. I slowly (30 seconds) raised the voltage on each capacitor to 60 volts, no excessive current, no reforming noted :-)) Parallel resistance seemed OK for all. Here is Ed Thelen and Robert Feretich behind the CT 1402. Ed ramping up the voltage to each capacitor and watching discharge through the meter, Robert figuring how to use a use a more complete tester. When we left the floor tiles after removal of the west wall Liebert air conditioner, see here, the edge was weak and mostly with in 4 inches of the wall. In another life Stan Paddock has access to a band saw, so he did some fancy measuring and fancy sawing, and Murphy lost the battle (old 1960s joke). Lookin' GREAT :-)) Glenn Lea is placing a cutout and protected tile for the operator side of the 1401. Only the tape cables come out of the other side. Note the holely floor tile, to pass cool airconditioned air into the 1401 fans. And the many cables get really cruddy over the years. Frank King is motivated to have clean cables so that further handling and laying is not so distressing. Frank and Stan with 'em all stretched out. The cardboard helps absorb the liquified crud. Frank and Glenn working on the cables where they are wired into the 1401. Frank and Glenn still at it - the cables were much more pleasant to handle - see laying cable further down. Then noticed that the loading window was taped to stay up, but would not stay up. Missing interlock activator clip Load window hardware seems good but there is a problem here. 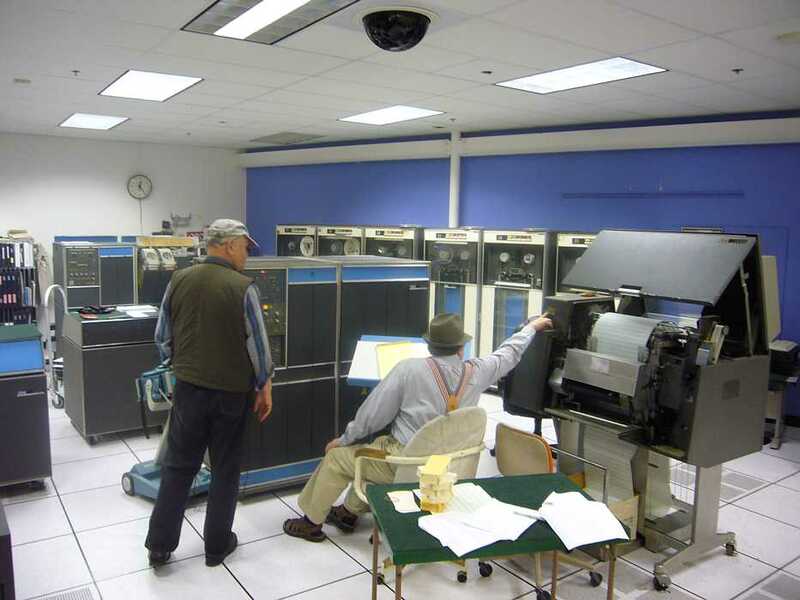 The cables are clean, Frank is happy and left, Ron gives Stan and Ed technical information of which cable end go to which machine from the 1401. Present were: Present were Ron Williams, Frank King, Bill Flora, Bob Feretich, Joe Preston, Stan Paddock and Ed Thelen. I (Ed Thelen) came to work, happily humming, planning to do the Connecticut 1402 20 volt power supply, and maybe start	the six or so power supplies in the CT 1401. Frank King pointed out parts are missing for the Card Tray support system. The over-heating of the DE 1402 Card Reader motor was puzzling. Ron Williams suggested that one phase of the 3 phase motor was left on when the motor was turned off (the heavy duty relay opened). He reported that the motor seemed to stop much more slowly than normal. Maybe one contact of the relay was stuck shut. Well - all contacts opened, the contacts looked reasonable, but the motor was still getting hotter and hotter !! Time to turn off the system power. 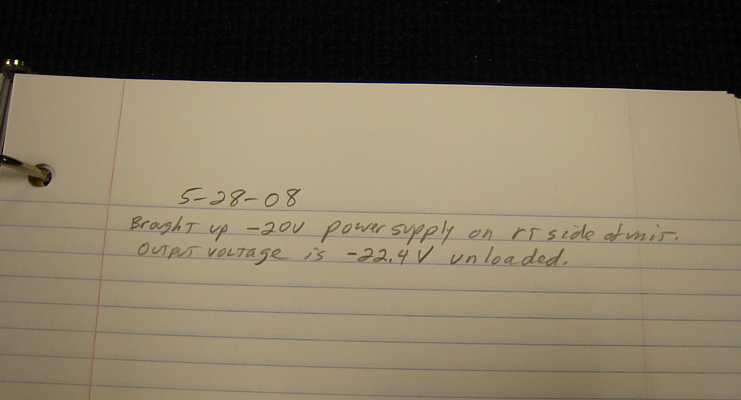 What a puzzle - Stan came by so I watched motor voltages and heating (back side of 1402) and he worked on the relay, fuses, and other circuity (front side). We then took him on a special tour of the Babbage Difference Engine #2 newly arrived from London. Report from Ron Williams - Present Ron Williams, Tim Coslet, Judith (time sharing with front desk duty). 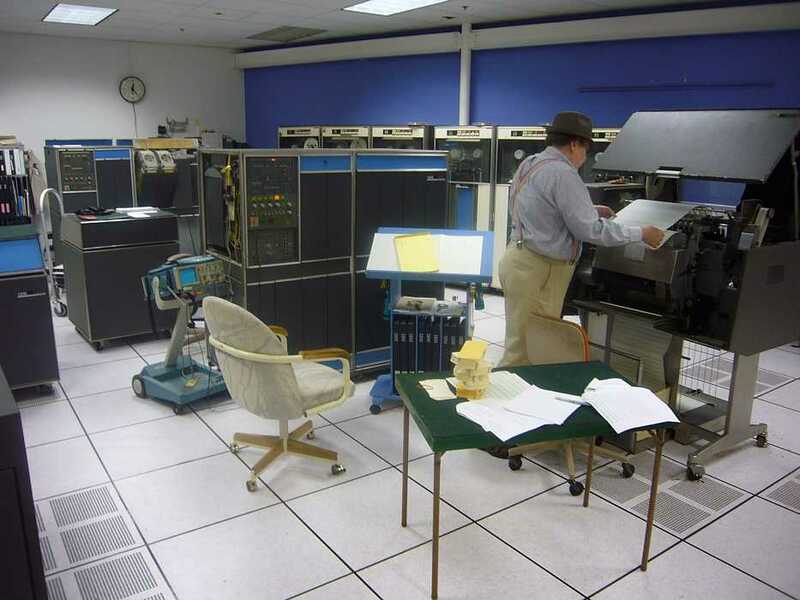 Ron Williams ran some tape programs, found failing loop in a previously working demo program, waiting for author to try to help diagnose the problem. Tim was going to repair a computer card - not sure if he did. Present were: Present were Ron Williams, Frank King, Allen Palmer, Bob Feretich, Joe Preston, Stan Paddock, Robert Garner and Ed Thelen. The nagging trouble that BIGPRINT based demo decks would no longer work is solved. This problen started weeks ago when the DE 1401 was moved a little to make room for the CT 1401. Simple tests and demos still worked but BIGPRINT would read all the cards and hang waiting for more cards. It was a mighty struggle between two stubborn men and one stubborn beast !! And you thought mules have a reputation !!! 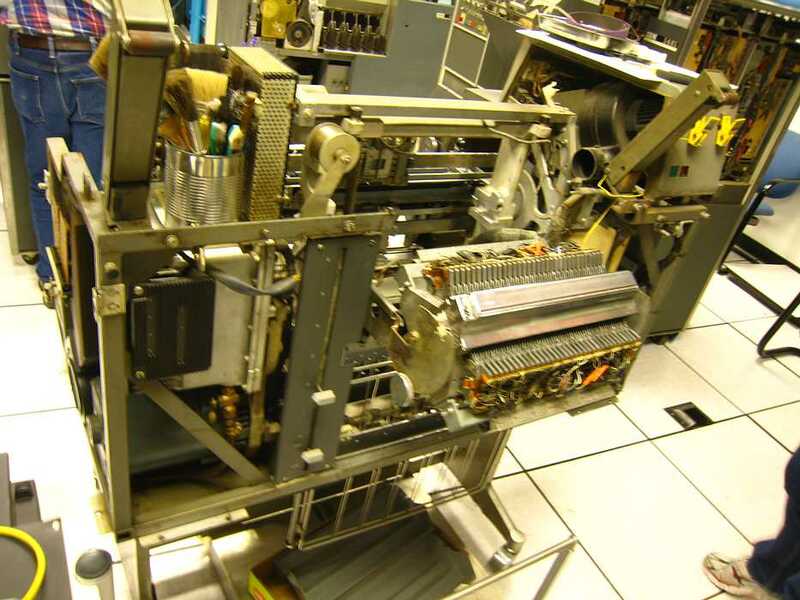 The first instruction in a subroutine must be an "SRB" which saves the B register (address of instruction following the "CALL") in the branch instruction at the end of the subroutine. 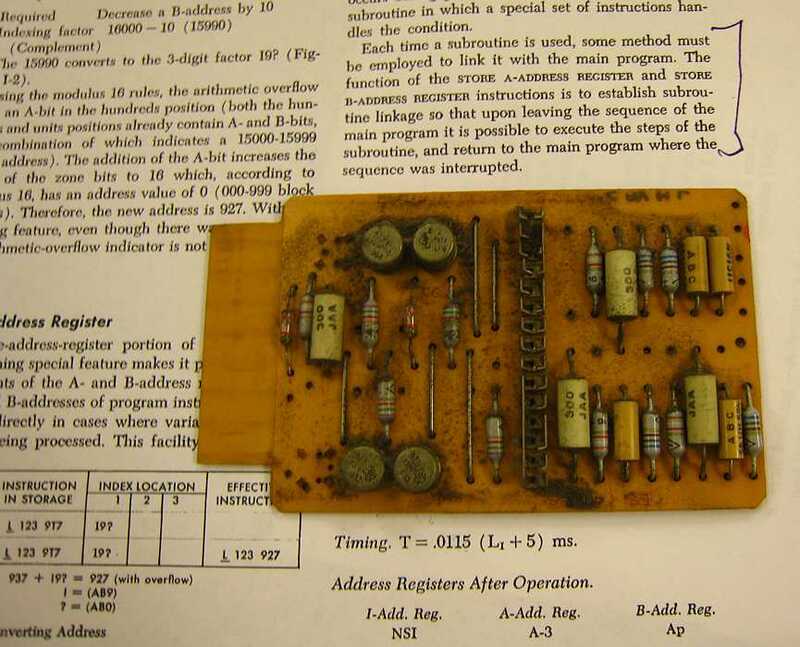 But the address of the start of the subroutine was in the B register, causing the unintended infinite loop. 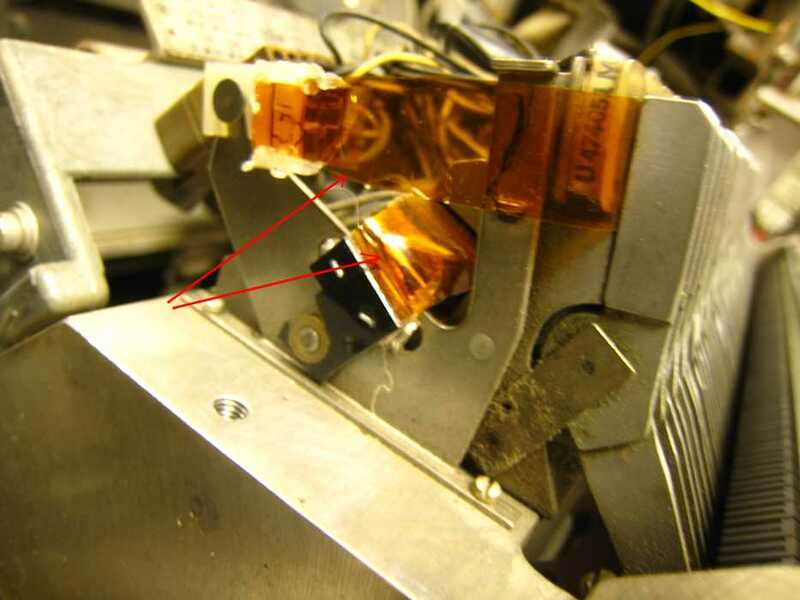 - only to realize that during re-assembly, one of the multiple "cams" in this assembly had shifted during re-assembly, and he had to disassemble it all over again. 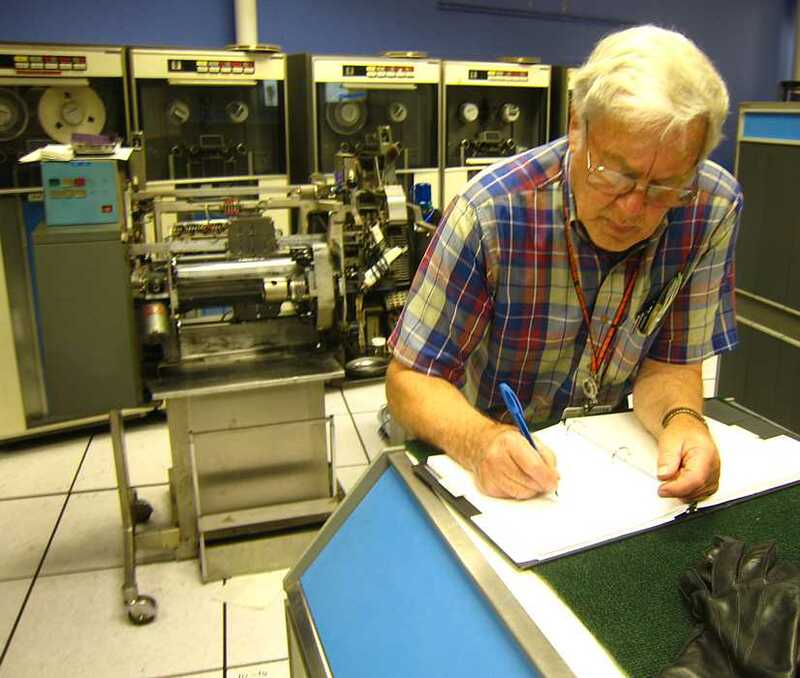 Bob Erickson, our "famous" mechanical "genius" says that only one or two people in a region were really qualified to reassemble the 026 printers. 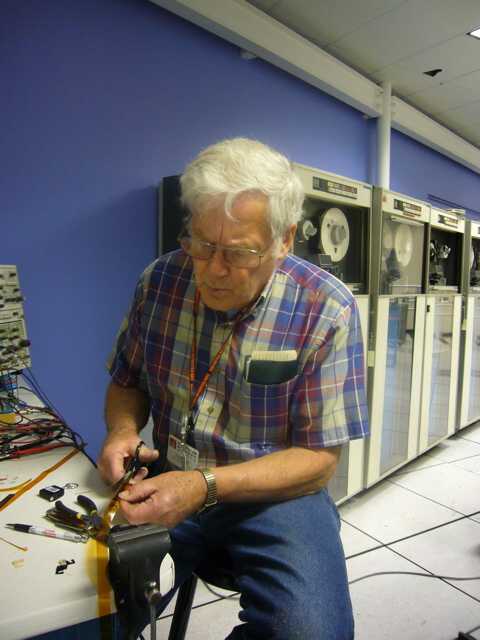 Ed Thelen, after steping through subroutine code (above), finally got to check one of his beloved linear power supplies.